Researchers (aka Robert Lustig) have been pointing to sugar as the root of many modern diseases in recent years. The CBC recently wrote this article about the toxicity of sugar as well as devoting an episode of the Fifth Estate to the subject. While I do think that there may be some merit to the research, particularly in regard to fructose, I am reluctant to wholeheartedly support the stance that sugar is toxic. I’m not convinced that, in and of itself, it is in fact a poison. Think about all of the nutritious fruits and vegetables that contain sugar. Should we purge them from our diets because we’re eating too many cookies? It’s a bit like throwing the baby out with the bath water, I think. Any time that one specific nutrient is vilified (or exalted) it always tends to lead to us making things even worse. We decided that butter was bad for us so we replaced it with block margarine. We decided that fat was bad for us so we loaded our foods with sugar and salt instead. We decided that salt was bad for us and are only just now starting to learn that, in some cases, restricting our sodium intake may actually be more damaging than not. And then look at antioxidants like vitamin E which we thought were so wonderful and then turned out to increase the risk of prostate cancer in men when taken as a synthetic supplement. Yes, it’s quite likely that the majority of us are consuming excessive amounts of sugar. Too much of anything is bad for you. Instead of cutting out all sources of sugar, try to consume fewer packaged and highly processed foods. Eat fewer baked goods, don’t drink pop or juice, and avoid adding sugar to your coffee, tea, and cereal. No need to toss that juicy honeycrisp. Tags: Dr Robert Lustig, nutrition, poison, sugar, toxin | Permalink. You claim to ‘dispel myths’ but do nothing of the sort. I will applaud your effort to promotes nutritional balance and moderation. The term ‘sugar’ as you use it, refers to white, refined sugar; an unnatural, unhealthy food additive heavily produced and marketed since the early 14th century. As Dr. Lustig commented, this refined, unnatural version has been proven to be associated with many chronic diseases, hence it’s alternative label ‘the great white thief’. Comparing sugar in whole foods to refined white sugar is comparing apples to artificially flavored orange Tang! Sugars occurring naturally in fruit, vegetables and dairy are NOT toxic because they come balanced with the proper mineral and enzyme counterparts. This allows our body to utilize, metabolize, or excrete what it needs or doesn’t need. 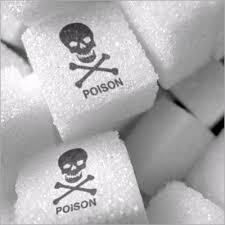 If I were you, I would use caution in trying to promote sugar as ‘non-toxic’. While I appreciate your comment, a link to scientific evidence for the harm of sugar would be much more useful than a link (and quote from) an organization promoting quackery. The quote was only supplement, my comment stands as do the facts against refined toxic white sugar. Go ahead, keep promoting white sugar to your readers, your loved ones, yourself. It’s to be expected from a ‘DIE-titian’. I can only assume that you haven’t actually read this post, or any other I’ve written about sugar, as I do not “promote” white (or brown) sugar.